Why was Jesus silent during His trial? 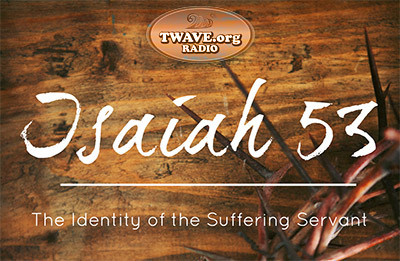 Vic Batista: We have been reading about the incredible prophecy of the Suffering Servant in Isaiah 53. Nathan, could you do a re-cap of the chapter so far before we finish up this amazing chapter? Nathan Jones: Certainly. Isaiah was a prophet who lived about 700 years before Jesus first came, so about 700 BC. He was a prophet during the time of a number of kings, but particularly King Hezekiah's reign. Isaiah was given many prophecies by God, for he is one of the most prolific of the Old Testament writing prophets. He provided a lot of prophetic information about Jesus' First Coming. And Isaiah 53 is just all about that! Some 700 years before Jesus came, God through Isaiah revealed all these fantastic prophecies about what the Messiah — the Suffering Servant — would have to endure in order to buy mankind freedom from our sins and the punishment for that sin. Vic Batista: It's unfortunate that there is so much confusion regarding who the Messiah was, even among the Jewish community, because they don't see this prophecy as it being about the Messiah. Nathan Jones: No, the Jewish view of the Messiah is that someday some everyday person will have the Holy Spirit comes upon them and empower them to lead Israel out of some kind of dark era. This empowering would be similar to the judges from the book of Judges, like when the Holy Spirit came upon Sampson and super-charged him with awesome strength to rip huge gates off of buildings and kill thousands of Philistines. That is the kind of Messiah the Jewish people are looking for. When Jesus finally came, the Jewish people were looking for a political savior to rescue them from the Roman Empire. They didn't understand why Jesus had come humbly and lived poorly and then gave up His life by dying on the cross. Jesus' followers were so confused about that aspect of the Messiah. But, after Jesus was resurrected, they finally understood. There are quite a number of Messianic passages that talk about Jesus as a Suffering Servant. This Messiah is the One who came to take away our sins upon Himself. He suffered and died on our behalf. He then beat death by being resurrected, which provides the Christian's victory over death as well. That's what the Messiah's First Coming accomplished, but there are many Messianic prophecies that tell about a king who comes and conquers evil and sets up an earthly kingdom. And so, as we are after-the-fact since Jesus died on the cross, we now know that these passages all apply to Jesus, but in two different comings as the Messiah. The First Coming was when the Messiah came as the Suffering Servant, but at the Second Coming He comes as the Conquering King. Vic Batista: Nathan, let's backtrack to Isaiah 53:6. Can you read that verse before we continue to move to the end of Isaiah 53? Nathan Jones: Sure, let's reread verse 6: "We all like sheep have gone astray, each of us has turned to our own way; and the Lord has laid on him the iniquity of us all." Here God compares people to sheep. Sheep wander off and they're not too bright. They often get lost and so need a shepherd and sheep dog to keep them penned in and organized. Similarly, people go astray. We rebel against God. We sin against Him. We want to do our own thing. We have turned to our own way. Because of that rebellion, that enmity against God, the punishment for our sins weighs upon us, and that punishment is death in Hell forever hangs over us. And so, the Suffering Servant — who is the Lord, the Messiah, the Perfect One — came to take the iniquity of our sins onto Himself. The Suffering Servant, Jesus Christ, would come to sacrifice Himself and take the punishment for our sins upon Himself. Vic Batista: Wow, that is incredible love! Sheep are not very wise and they really don't have any protective mechanism. Nathan Jones: Exactly, sheep are the most defenseless of creatures and have no natural ability to defend themselves without humans protecting them. It's amazing that we have any sheep today! People are like that, too, as we think we are all tough and we can do it all on our own, but we're not very strong. We are like sheep. We are defenseless against the world. As the oceans of trouble and tribulation sweep down upon us, we need Jesus Christ to save and rescue us from our sins. That is exactly what Jesus accomplished when He first came. Vic Batista: Verses 7-9 gives us more details in terms of how the Suffering Servant suffered and what He underwent for us. "He was oppressed and afflicted, yet he did not open his mouth; he was led like a lamb to the slaughter, and as a sheep before its shearers is silent, so he did not open his mouth. By oppression and judgment he was taken away. Yet who of his generation protested? For he was cut off from the land of the living; for the transgression of my people he was punished. He was assigned a grave with the wicked, and with the rich in his death, though he had done no violence, nor was any deceit in his mouth." Vic Batista: Here in this passage we begin to see a glimpse of what happened to the Messiah that was prophetically fulfilled in the circumstances surrounding Jesus' trial and subsequent death. Actor and Director Mel Gibson did a great job in a movie he made a few years back regarding the crucifixion of Christ fulfilling the prophecies of Isaiah 53. Nathan Jones: Again, Isaiah 53 just blows my mind! Here this prophecy that was given 700 years before Jesus came. The passage tells us that the Messiah would be oppressed and afflicted, and even though He was suffering persecution, He didn't open His mouth. That was truly what happened when Jesus went through His trial. He was beaten and brought before the Sanhedrin and King Herod, and yet Jesus didn't open His mouth. He didn't say anything. He remained silent during the trial so that He would be sentenced to death and in order for Bible prophecy to be fulfilled. While Jesus the Suffering Servant was oppressed by the Sanhedrin and the Romans, and judgment was handed down to Him by Governor Pontius Pilate, during that final Passion Week nobody in His generation protested. People would come and give false testimonies against Him. Nobody stood up in defense of Jesus. And there it asks in verse 8, "Yet who of his generation protested?" None of them did! Isaiah prophesied that the Suffering Servant would be cut off from the land of the living. And truly, Jesus was crucified on our behalf. He was punished and yet was innocent. Verse 9 tells us that the Suffering Servant's body would be placed in the grave of a rich man. That too is exactly what happened! Jesus had no money, so Joseph of Arimathea who was a rich man gave up his very nice, fancy tomb for Jesus' body to be buried in. Jesus was sacrificed, yet He had done no violence, nor did any deceit ever came out of His mouth. These verses are just jammed packed with prophetic messages that came true 100%! Vic Batista: And the accuracy, Nathan, that's what's so mind-boggling. As you mentioned, these prophecies were given over 700 years beforehand, and in such detail. Nathan Jones: There was a mathematician named Peter Stoner who calculated that one man fulfilling just 8 of the 109 prophecies had the odds of 1 in 10 to the 17th power. That's a 1 followed by 17 zeros! That's an astronomically high number. Such a fulfillment would be impossible, unless there is something of a miracle involved. That miracle could only be explained by God who in His divinity caused the fulfillment. Jesus Christ fulfilling just 8 of the 109 prophecies about His First Coming would be impossible unless He was God. Therefore, we know that Jesus Christ is the prophesied Messiah. In the ninth and last part of our study of Isaiah 53 and the Suffering Servant, Vic and I will look into the life of the Messiah as the Intercessor. Okay, when we get to our eternal state I want to get together for some Bible study with both of you. I'm sure you'll be able to find some free time in your calendar of forever. Billy, glad to hear you've been blessed by this series!